The Yield collection wide swivel chair by Avenue Six features sleek, contemporary styling to enhance the interior design of any waiting room or reception area. Yield collection will appease those who seek a high level of style and comfort. 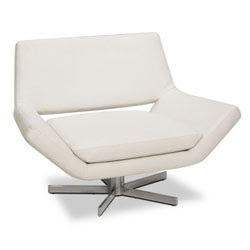 Guest chair features a 360 degree swivel, White vinyl upholstery, foam-filled back and seat cushions, extra wide five-star chrome steel base for maximum stability, and protective floor glides. At Avenue Six, Reitzin’s vision for creating distinctive furniture designs continues through the development of beautifully styled, space saving furniture for the home or business. Paul Reitzin, president and founder of Avenue 6, has been a leading innovator of RTA (ready-to-assemble) furniture for more than 25 years. Among his accomplishments was the establishment of Studio RTA, a highly awarded importer and marketer of trend setting RTA furniture for the home and office. His extensive hands-on experience includes product development, overseas sourcing, sales, merchandising, management and operations. Avenue Six has assembled a collection of innovative, eye-catching designs that focus on fresh new trends, which combine form and function to create the perfect living space, from modular and upholstered RTA furniture to occasional dining and seating. Avenue Six also offers a complete line of contemporary, fully assembled furniture collections for the home with the same comfort, style and value as our RTA merchandise. A more affordable alternative to fully assembled furniture, the upholstered collection by Avenue Six provides a space efficient means to sell in-stock items with the drive away convenience only RTA can offer. Customers will embrace the ability to immediately pick-up and take home their RTA purchase. They will also appreciate the more affordable shipping solution should they choose home delivery. All RTA furniture includes beautifully designed packaging that features clear images along with concise, informative copy points to enhance visibility at the point-of-purchase. Additionally, a variety of in-store graphics and customer support brochures are available to stimulate sales. Because convenience and easy assembly are essential to customer satisfaction, all product instructions are clearly written and designed to illustrate the simple steps required for quick and simple assembly. Avenue Six offers both direct import and warehouse sales programs to better serve its customers. Drop shipments from its domestic warehouse are also available to speed the processing of orders.